This week Jesus proceeds to Jerusalem, determined to fulfill his purpose. I am excited that this 40-day Fast has revealed to me more about my life’s purpose. I’m sure during your Daniel Fast you have received an answer to your prayers, gained a surprising revelation or new insight that you can point to because of your closer walk with God. I hope you take time to tell somebody, record your thoughts in your journal, or sit and reflect in your own private space what a difference this Daniel Fast journey has made in your spiritual life. The Scripture Gospel reading, John 12:1-8, for the Monday of Easter week finds Jesus in the home of his friends Mary, Martha, and Lazarus. Mary has taken it upon herself to lavish Jesus with an expensive ointment—she is anointing him. He receives this anointing as preparation for his death, the purpose that fulfills God’s will for him. 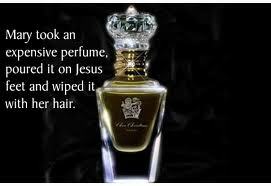 He does not avoid his anointing. He does not say that he does not deserve such an extravagant anointing, nor does he scold Mary for her generous gift to him. He receives the gift and knows that it is part of God’s plan as he carries out his purpose. I have not been as gracious as Jesus about receiving the gift of my anointing. I am a writer. I have written for many years. Even with writing, publishing and getting paid I still did not call myself a writer. I was given this lavish gift of my anointing as a writer, but I found myself saying, “Oh no—that’s not me. I am a counselor who writes; a mother who writes.” I was not graciously accepting God’s purpose for my life. During this Lenten Fast I claim my identity as a writer. It took weeks of listening, praying, and releasing my will to God’s will to become aware that God is calling me to a “new thing.” I am finally willing to allow the light from staying close to Jesus to make plain to me what has been evident to my friends for years—I am a writer. I love to write and I write whether I am paid or not; either way I am honoring God through my gift. I am determined to walk in the light of my anointing. Has your Daniel Fast made you more open to the lavish gift that is your anointing? After weeks of fasting and praying do you walk in your purpose with steadfast determination as Jesus walked in his journey to Jerusalem? During this final week I hope to focus on how I may use my writing in a way that will bring life to me and also to others. 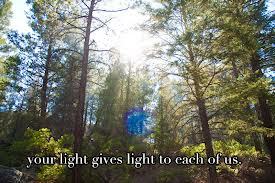 Prayer: O Light of God, thank you for lavishing me with the generous, extravagant gift of your anointing so I may serve others. Amen. Posted on April 14, 2014, in Uncategorized. Bookmark the permalink. 1 Comment.